Gold has always fascinated mankind. Its special colour and shine has inspired people for thousands of years. Even before the ancient Egyptians built their pyramids, gold was used to manufacture jewellery. Platinum, maybe even more so than gold, is the perfect material to use in jewellery. It is one of the strongest materials in the world, is incredibly durable and looks beautiful. Gold has captivated people’s imagination ever since it was first discovered. It is one of the world’s rarest materials. Thanks to its special finish and total resistance to rust, it has been used for jewellery since the dawn of civilisation. Pure gold is a rather soft metal. One gram of gold can be stretched out into a sheet of one square metre. In order to make gold usable for jewellery it first needs to be made stronger. This is done by making an alloy with another metal such as silver, copper, nickel or palladium. The metals used for this alloy also have an effect on the colour. The most common colours of gold are yellow, white and pink. Untreated white gold has a faint yellowish colour. That’s why white gold jewellery is treated with rhodium, a very hard white metal. The purity of gold is expressed in carat (not to be confused with carat in gems). 24 carat is pure gold, 22 carat is 91.6% pure, 18 carat 75% and 14 carat contains 58.5% gold. 18 carat is by far the most suitable for jewellery. That’s why Maximilian only uses makes jewellery with 18 carat gold. Platinum is the purest precious metal in the world. 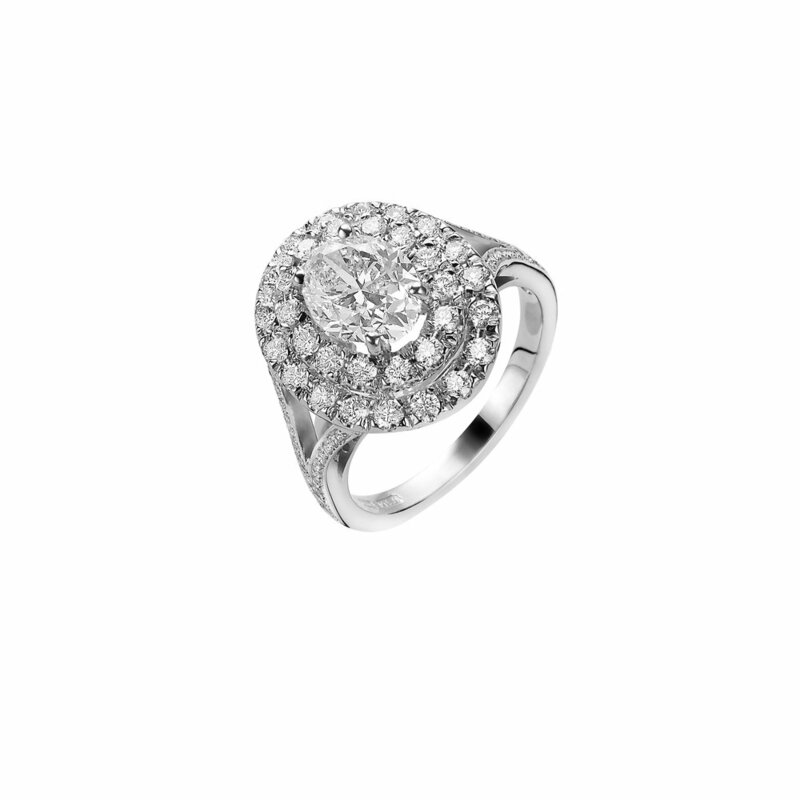 Platinum is very strong by nature and has a beautiful, pure, white colour. This makes it the perfect material for jewellery. Platinum is also very rare. To mine 1 ounce (28.35 gram) of platinum 10 tons of ore.
Because of its durability platinum, just like diamonds, is a symbol of eternity. That’s why it’s a very wanted material for engagement rings.